"Easy to make, sweet and yummy!! This a very creamy summertime recipe!! 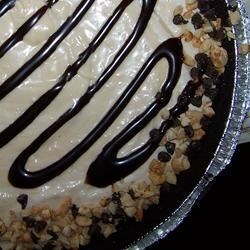 Top each pie slice with a dollop of whipped topping!" In a large bowl, beat the cream cheese and milk until blended. Mix in the sugar and peanut butter until smooth, then fold in the whipped topping. Spoon mixture into all 3 graham cracker crusts. Drizzle each with chocolate syrup and a sprinkle of peanuts. Cover and freeze for about 2 to 3 hours. Easy to make and delicious. I only filled two store-bought pie shells, though. A friend tried this same recipe and used all three. I guess it depends on how full you like them. This recipe is fantastic. I used a chocolate cookie crust and sprinkled chopped nuts and mini chocolate chips around the outside of the crust for a dramatic effect! This was really good and very easy to make. I added smuckers magic shell like others and put chocolate chips around edges. Awesome! It is a good thing this recipe makes more than one pie because it disappears fast!! This is a great make ahead pie to have on hand for unexpected company. I love it!